The creators of Motherpeace Tarot have departed from traditional (and often patriarchal) imagery of tarot, and have instead embraced the goddess spirit. The feminist emphasis is balanced with several male figures present in the deck. Motherpeace’s round cards and primitive artwork allow the reader to rely on intuition rather than standard “black and white” meanings. The four suits of the Minor Arcana are Cups; Wands, depicted with African culture; Discs, illustrated with Navajo culture; and Swords, depicted with Greco-Roman imagery. 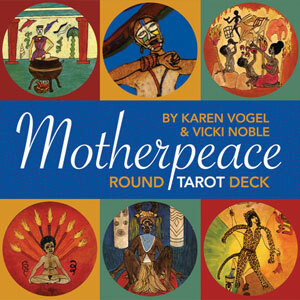 Karen Vogel is a renowned intuitive who is widely known as co-creator of the Motherpeace Tarot deck and as a tarot reader, teacher and writer as well as an extraordinary artist. Karen's creative voice expresses her deep sense of animation and spirit in nature. Karen's art has appeared prominently in a number of well-known performances installations in the Bay Area of California. She is the author of Coyote Tails and the illustrator of Secret of the Missing Crown. Vicki Noble is a radical feminist healer, author, independent scholar and wisdom teacher. After writing Motherpeace Tarot, she has written several books, including Shakti Woman (a handbook for healers) and The Double Goddess (a history of female shamanism). She has developed a powerful ritual healing process, teaches and lectures internationally, and has led tours of women on pilgrimage to sacred Goddess sites around the world.